This week, the days seem unbelievably long. I just basically seem to have SO FREAKING MUCH TIME (First World Problems again). It just occurred to me that there’s a reason for that: last week, there was an awful lot of running off to rehearsal and class and that TV news thing; this week, there’s … well, there’s class? Class and housework. Some technologizing in the margins. I’m fine with that. I’m really not complaining. It’s actually pretty nice—it’s just weird and surprising how spacious this week feels after last week’s compressed, frenetic schedule. You would think I’d have figured it out by now; that I’d have been around this block enough times to be able to predict that, hey, this week is way less busy than last week so it’s going to feel luxuriously slow, but nope. I haven’t figured that out yet, apparently. My brain is on a break, or I’d try to draw some really intelligent correlation between this kind of experiential relativity and Einstein’s relativity. Like, I feel the germ of an idea kicking around in there, but I can’t quite seem to get hold of it. 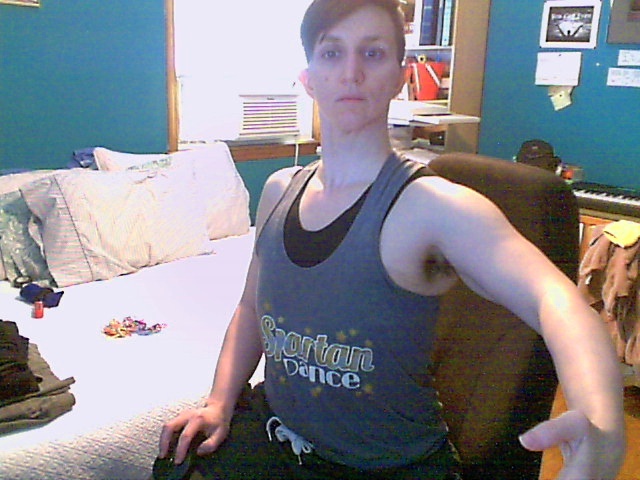 Anyway, this morning I did barre and adagio, then made my excuses (foot, as usual >.<). Killer B gave me a correction that made my arms look awesome: keep the shape of the arm as is, but imagine that you’re pressing the whole thing down against something. Curiously, what this accomplishes is not arms that collapse, but arms that look strong and shoulders that stay open and down and back and all that good stuff (read: all the other stuff BW regularly reminds me to do ^-^). Basically, it’s like when you’re a little kid in those swimmy things (they still make them—who knew?!) that go on your arms, and you’re using your lats to push them down against the water so they push you up. Maybe normal people don’t do that, but during my Swimmies-wearing phase, I totally did (in my defense, I was 2.5-3 years old) because I liked being able to go Boing!Boing!Boing! in the water, usually whilst my grandparents’ German Shepherd/Alsatian looked on with a heckin concern. We also had those floaty swimsuit things that make you look like some kind of undernourished koopa: basically, an aquatic romper with what was essentially a couple of small kickboards—one in front and one in back, if memory serves—sewn between two layers of lycra. Mine was initially too big and would ride up and bonk me in the chin and chafe my armpits. By the time I was the right size, I already knew how to swim well enough not to need it. For those in the US who are not dog nerds who spent too much of their formative years reading dog books from the UK, German Shepherd = Alsatian. 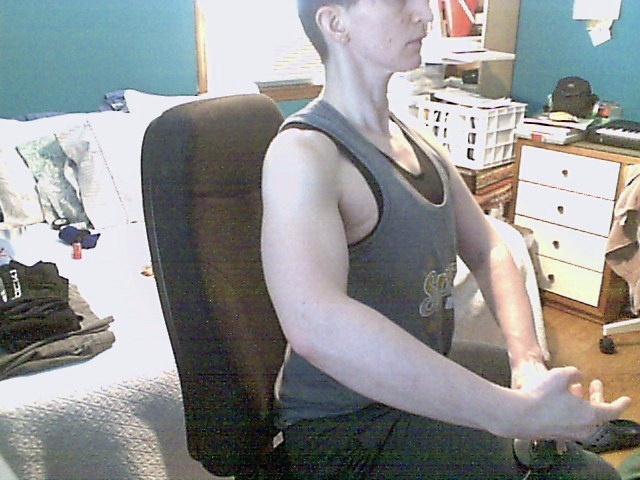 Lats more or less unengaged. 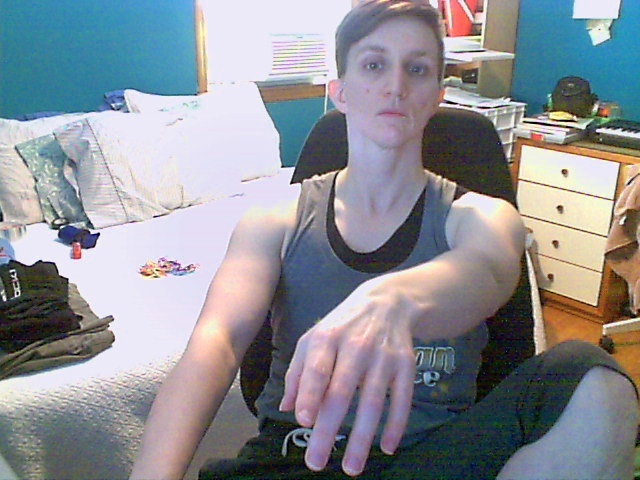 Lats engaged; trying not to laugh at myself. Lats unengaged. Languid ballet prince is languid. 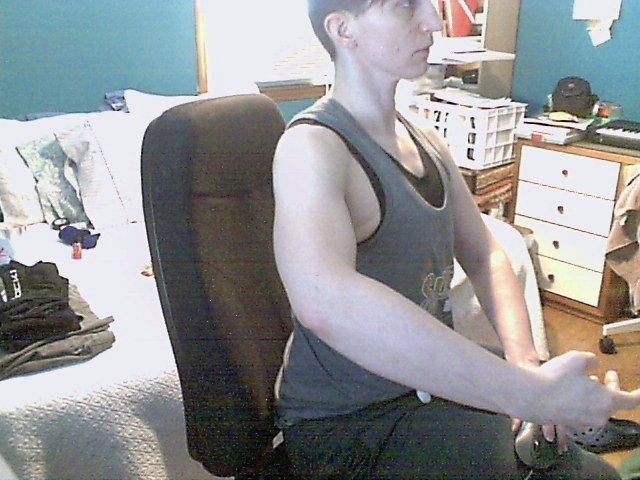 Lats engaged so much they MOVED THE BACK OF MY CHAIR, y’all. Fishface engaged, because why not? 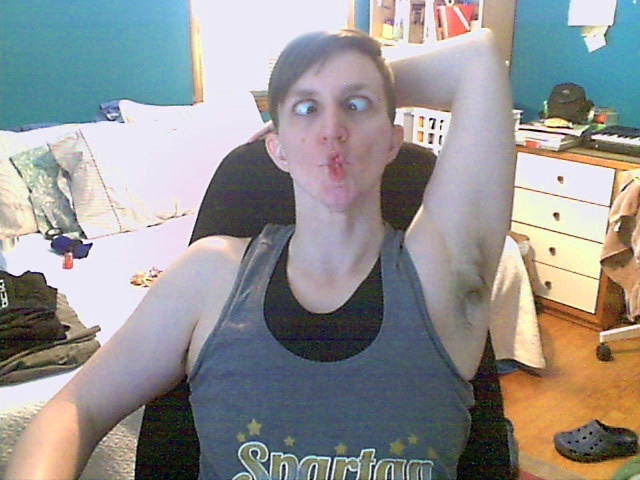 Fishface is a critical ballet skill and woefully under-taught. In case you’re wondering, this is my office/guest room, where I’m in the midst of catching up on the laundry after last week’s scheduling madness. The really interesting thing is that I didn’t actually change the angle of my arm between the first and second shot in any of the sets: engaging my lats moved my entire shoulder joint. That said, I don’t think pix 5 and 6 are great illustrations of anything except the fact that engaging your lats makes your neck look longer. Picture 7, meanwhile, is just silliness for its own sake. I’ll have to try to get better pictures of this effect next time I’m in the studio. It was hard to get enough of my body in the frame and still be able to click the mouse (I appreciate voice-activation so much more right now, you guys). I would’ve done better just to use my phone and email the pix to myself, but that seemed like too much work. One of these days, I’ll try to see if I can get D to take a picture of what this looks like from the back, because I really feel it right below the margins of my scapulae/shoulder-blades/wing-bones, and I suspect that it’s probably quite visible. I am not, however, very good at taking pictures of my own back. You might be a dancer if you get home from rehearsal, decide you’re too tired to fold the already-clean laundry, but then put your Ballet stuff in the washing machine and stay up ’til it’s done so you can hang it up (because #priorities). The Badger Cabinet Problem, Episode 01: Possible Solutions? D installed new cabinets in our kitchen some while before I arrived in his life. He bought them as a lot, rather than having them custom-built, because he’s the frugal kind of person who does that kind of thing and makes it work (I love that about him). Anyway, I think our cabinets were originally intended for a more typically-sized and -laid out kitchen. This led to one significant problem: a deep, inaccessible well in a corner where two cabinets should connect, but don’t. I’ve dealt with the problem, thus far, by shoving things I rarely use into that deep, dark well. This is all (ahem) well and good until I actually do need to use them. Then, it’s a giant pain in the neck to pull everything out of the near end of the cabinet so I can fish around in the far end, hoping against hope that nothing with big, sharp teeth is hiding in there(1). Okay, it’s fairly unlikely that there are, say, badgers living in my cabinets, but there’s still something I instinctively dislike about shoving my arms into dark hidey-holes. On the other hand, if anyone needs a secure place to stash the One Ring for a few decades, my Badger Cabinet is probably a good choice. Anyway, I’ve been wracking my brain trying to come up with a better way to manage the Badger Cabinet, and I think I’ve finally figured something out thanks to a really expensive sliding spice rack. Denis would almost certainly murder me if I spent nearly $80 on a sliding spice rack right now, or even $45 on the single-tier version that holds “large containers,” but he almost certainly(2) won’t murder me if I buy some appropriately-sized plastic or metal bins and some of those stick-on felt slidey feet, as long as I don’t spend too much money. One set of bins could go up front, so rather than removing a bazillion individual bottles of miscellaneous oils, tins of baking powder, bags of baking soda (I have discovered that you can buy baking soda, which I use both for cooking and cleaning, in 2-pound bags), I’ll just have to remove a few bins. The slidey feet will make it easier to get the the bins in the back out. Et violà—no more sticking my poor, naked arms into potentially badger-infested dark holes. I will have to measure our fancy stand mixer to confirm this, but it might even be possible to move the Fancy Stand Mixer (which currently lives atop the fridge, where I can’t reach it for fear of dropping it on my own head; that thing is heavy) to the cabinet, where I could potentially wrestle it free without risking cranial injury. Then I could actually use said Fancy Stand Mixer. That or else I could move the Fancy Stand Mixer to the spot on the countertop where the SodaStream and several cookbooks currently live, then move those guys into the cabinet above or onto the top of the fridge. I could even move all the random junk that lives in the large cabinet under the flatware drawer up into the Badger Cabinet and then use it to store things like the bread machine (also currently inaccessible due to its precarious perch atop the fridge) and possibly some of my loaf pans, cupcake molds, and so forth. There’s also a Badger Cabinet on my stove. Right now, it holds all the muffin tins, loaf pans, and so forth, but they’re not very well organized. (Okay, really, they’re barely organized at all.) I have some plans to improve that situation; the challenge is finding the right parts. I’m thinking a combination of slim tension rods and some kind of heat-resistant shelf could work. So there we have it. A possible solution for the Problem of the Badger Cabinet. I’ll check back in once I try implementing one of my possible solutions. Last night, I dreamt very vividly about successfully attempting quadruple turns. I should probably note, though, that the class in question took place in something like a a church fellowship hall, we had to clear up folding tables and chairs first, and I accidentally stole some girl’s water. But still, I hope the turns part will be like the dreams in which I sorted out Albrecht’s variation. Low ceilings. 8-foot ceilings are sub-optimal for dancers, chandeliers, heat distribution in punishing Southern summers, and ceiling fans. Lack of cross-ventilation. This house was built after WW II, and the floor plan seems to assume central air conditioning. It does not have central aircon, however, and thus is a boiling misery even on days when a little proper cross-ventilation could solve the problem. Too much clutter. I find it hard to clean around clutter. D won’t get rid of his stuff, so instead I’m getting rid of mine bit by bit. Too many small rooms. There’s no reason a house this size should have a separate dining room at the expense of counter- and cabinet-space in the kitchen (which it too small even for a rolling island). If I make one major change to this house, it will be to knock out a couple completely-extraneous walls (they don’t even have have electrical outlets, let alone ductwork or structural importance) to join the kitchen and dining room. This will allow for a much better kitchen while still preserving a reasonable dining area. The location. Our neighborhood is not walkable at all by most people’s standards. By mine, it is unpleasant to walk in. This is one thing about the house that I can’t change. Edit: Oh, yeah—left out the thing that inspired this post in the first place. I really profoundly dislike the fact that the front door opens right into the living room. Full disclosure: I grew up in a pretty big house with an actual foyer. This is the only place I’ve lived that had an entry directly into the living room. It feels weird and exposed. Maybe that could be changed along with the kitchen, if we stick around long enough. On the other hand, it’s probably not worth it. It’s a house. At the end of the day, that’s nothing to sneeze at. The kitchen, though tiny and not terribly efficient, is rather private. I actually used to hate that; I would find myself washing up after dinner and bitterly resenting the fact that D was relaxing in the living room, watching TV. Then I thought the problem through and realized that I could listen to documentaries or podcasts while working. Now my kitchen is really a haven for me; a place where I can both be alone (which, as an introvert, I desperately need) and get things done (which makes me happy). The port de bras mirror in the bathroom. There’s a huge mirror, probably 5 feet wide by four feet high, that takes up an entire wall (from the edge of the linen cabinet to the side wall of the house). This mirror is where I practice port de bras. This and video are why my arms look less stupid than they used to. The colors. D is not afraid of color, and as such we do not live in a sea of beige. Truth be told, this was also a factor in his making it past the Just Friends stage. The fear of color says a great deal about a person. I’d rather live with someone who decorates boldly and badly than with a timid soul who is afraid to decorate at all. Fortunately, D does it boldly and well. The world’s most efficient furnace. Seriously, the thing is dedicated and does its job insanely well. Our electric bill can be rather high in the summer, but it’s balanced by the ridiculously low gas bill in the winter. The mid-century main floor bathroom. For a long time, I thought I wanted to completely redo the main floor bath. The downstairs bath (technically a 3/4 bath, as it has a stand-up shower of the variety in which one whacks one’s elbows whilst shampooing one’s hair) is beautiful and modern, and I thought I wanted the main-floor bath to be beautiful and modern as well. However, as it stands, it has rather a charming mid-century modern feel that could be fully realized by replacing a few broken floor tiles, removing a seriously hideous set of shower doors, and repainting the walls. I haven’t decided whether to replace the shower doors with something period-appropriate or something more up-to-date, but unobtrusive. The window above the kitchen sink. US homes built before the 1970s almost always feature a window right above the kitchen sink. For some reason, newer homes often lack this feature. Few things say, “Homemakers don’t matter,” quite as effectively as staring at a blank, depressing wall whilst doing the washing-up. Fortunately, my house does not suffer from this. So that’s today’s unusually-pedestrian post. Pathetic Fanboy Redux; Also, How Do Armband? A bazillion (okay, six) years ago, when I was training in Muay Thai(1), there was a “How Do Armbar” meme that circulated the Mixed Martial Arts forums and made us all snicker uncontrollably and snorf our drinks at school and work. If you dance and are looking for an effective stand-up fighting game(because who isn’t, I guess? ), I highly recommend Muay Thai, because A) it’s hella fun and B) your existing flexibility, rond-de-jambe, grand battement, and ridiculously powerful legs give you a totally unfair advantage starting out. Basically, Muay Thai is a lot like ballet, only when you kick people in the head (for which, btw, you use your shins, not your feet), it’s on purpose and sometimes they grin at you and your instructor gets all joyfully goggle-eyed. Also, you get to learn the arcane art of hand-wrapping and how to legitimately punch a mofo, should need arise. There is much less face-punching in ballet. Usually. Anyway, I apologize for committing not only meme necromancy, but obscure meme necromancy, in my title. Regarding which: OMG, you guys! Why did I never think of recycling worn-out socks into phone armbands? Because I can’t leave well enough alone, I think I’m going to work on a version that folds over at the top and buttons, because dance, amirite? No way my phone is going to stay in an unsecured sock-based armband during tombé-coupé-jeté. Not for a minute. But this kind of thing could be incredibly useful for earphones-required rehearsals (Bluetooth earbuds are the best invention ever) and backstage warm-ups and everyday life (and running, and bike rides). Maybe I’ll sew them into pockets, too. Easy hand-sewing project, there. There are so many possibilities, here. I may never have to wear actual trousers with actual pockets again! In other news, I went and got my Pathetic Fanboy on last night, and it was so worth it (though the music for “Mother Ginger” always gets stuck in my head, presumably because #AncientAliens). First, it’s weird watching The Nutcracker year after year and ticking off the parts you could actually do (and those you could do if you just had a reliable tombé-coupé-jeté: regarding which—in men’s technique, tombé in second to achieve maximum liftoff, apparently; forgot to mention that yesterday). The last time I saw Nutcracker was two years ago. It was a totally different thing. I was really just climbing back into ballet, optimistically (and impatiently) forging my way back through all the stuff I’d learned as a kid. I had no experience of partnering. A lot of the men’s technique, in particular, still seemed further from my reach (let alone my grasp) than I cared to admit to myself. This year, much of the choreography seemed reasonably in reach—partly thanks to simply having learned a lot, and partly because learning Albrecht’s variation taught me that I’m more capable than I think (though, like Albrecht’s variation, maybe I would have to learn things with single tours subbed in ’til I have solid doubles). Anyway, watching BW dance was, as always, enlightening. First, I think it may have given me some insight into nailing down my double cabriole, which is one of next year’s #BalletGoals. Second, BW’s technique is beautiful and clean and classical. Likewise, he legitimately makes partnering look so natural and effortless that it could be the kind of thing that just happens while you’re walking down the street or what have you(2). I don’t recommend just, like, ambush-partnering people, though. That might be taken wrongly, all things considered. So, in short, don’t roll up to the bus stop and be like, “Greetings, my good lady/fellow/etc,” and loft people above your head. They really might not appreciate it. And he seriously has the most beautiful legs. He has gigantor thighs like mine instead of sylph-like, Hallbergian ones, which rather flies in the face of our collective assumptions about what ballet bodies look like(3). They’re robust, yet so finely sculpted that you can practically see the individual muscle fibers(4, 5). Though maybe less so for people who don’t constantly simmer in a vat of ballet. Honestly, I’m pretty convinced that when the average American pictures a male ballet dancer, they always picture Baryshnikov, Nureyev, or possibly Carmen Miranda, although she was neither male nor a ballet dancer. Also, no, I didn’t just spend the whole ballet creeping on BW, though it totally sounds like I did. White tights, you guys. They hide nothing(6). Which is why(7) we have dance belts. Well, that, hernias, and testicular torsion. The other bit that seemed interesting: I noticed a few moments in which things subtly Didn’t Go According To Plan, and also why. I don’t know if that’s just a function of two years’ more experience and technique, or if it comes in part of watching painful video of myself dancing and thus learning to see why tiny error A leads to less tiny error B(8). Possibly both? As a whole, I think only one of these would have been visible to audience members who are neither dancers nor true balletomanes. The second-act Sugar Plum pas de Deux wasn’t quite on form, though. I haven’t seen BR do classical partnering before, so I’m not sure if it’s not his thing or if it was just an off night. The casting for Arabian seemed a bit strange. BB commented that this may have been intentional; our new AD is into pushing dancers out of their comfort zones. Anyway, MK is the company’s resident Central Casting Classical Ballet Prince—and I mean that in a good way. That said, he’s not by nature the sinuous kind of mover the music demands. To my eye, he looked uncomfortable, and it translated into a stiff-ish performance. His partner, on the other hand, was perfectly cast. If I remember correctly, she also danced Sugar Plum opposite BW’s cavalier in the other cast, though I can’t remember her initials right now to save my life. Also, an errant paper snowflake drifted down from the rigging and upstaged (well, technically, downstaged) everyone during the last part of the pas de deux. If there had been, like, ten snowflakes, it wouldn’t have been quite as funny. Instead, it was just just the one snowflake that maybe was asleep or something during the snow scene. Frankly, it was pretty hilarious, but I refrained from from laughing out out loud or narrating (“Omigosh, how did I miss my cue? Well, the show must go on—BANZAAAAAAIIIIIIIIIIII!”). On the other hand, no little kids waved to their parents. Apparently that happened once last year, and will now circulate in the Horror Story annals of the company and the school forever. Of course, Nutcracker doesn’t close ’til the 22nd, so a wave could still roll in. The flowers, on the other hand, were really lovely this year, as were the flutes or Merlitons or whatever they are in our production (I suppose I could go find my program?). Tea—a solo in this company—was playful and skilful, while Spanish chocolate—a quartet—danced with brilliance and playful flirtation. On the whole, everything was beautiful and magical, as it should be. HUK shined as a very non-creepy Drosselmeyer, and one of my favorite dancers, SV, owned the Russian dance (our company’s rendition isn’t my favorite, but it’s still pretty fun). So that was Nutcracker, and now it’s on to whatever’s next. I know The Sleeping Beauty is coming up, and I’m looking forward to that. This is evidently what happens when I haven’t been able to dance—or do much of anything else—for more than a week, but I’m finally feeling well enough to do more than play “match 3” games on my tablet and sleep. Specifically, I fall down rabbit holes all over the Internet, then find myself googling related or semi-related things and falling down, I don’t know, jackrabbit holes. The game is afoot, but I’m cozily tucked up in its living room. I was going to write something about the same basic topic (except, like, I tend to call myself a “homemaker,” because people still be like, “Wait, you’re a boy, you can’t use ‘-wife'” and arguing about it is tiresome, and for all that my cat thinks he’s human and would happily ride around in a baby carrier all day if I got him one, I don’t have kids), but, y’all, Ravishly’s Katherine DM Clover has pretty much covered it (without even invoking the Sapir-Whorf Hypothesis, which has depressingly little to do with Star Trek: The Next Generation). So, in short, since this is a dance blog and you may not be super-interested in sociology, I’m not gonna be like OMG GO READ THIS AND THEN WRITE ME A 500-WORD ESSAY AND I EXPECT YOU TO TURN IT IN BY MONDAY, I’m putting it out here, because you might be interested in dance and sociology, and even in the power of language, so why not? I also enjoyed a post about fancy food, to which I can say: yes, for the love of all that is holy, I’m having a hard enough time mastering Homemaking 101 without delving into the arcane waters of Organic Quinoa Coffee Flour and Martha Stuart Everything (and also, while I’m at it, why is almost everything they print in Real Simple actually really freaking complicated?). I mean, don’t get me wrong, I’m not saying Organic Quinoa Coffee Flour is inherently bad — just, like, baby steps, y’all. Baby steps. At least for me. Because I was raised by cats. Um, I’ll be over here, trying to devise yet another system to keep from getting behing on the household book-keeping.